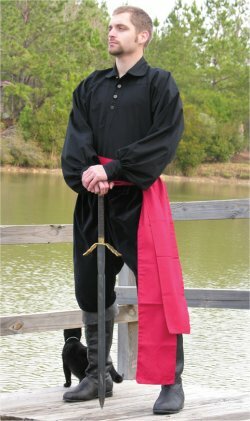 Our starter pirate garb set includes our Highlander Shirt, Sailor's Pants, and Red Cotton Sash to get you started looting and pillaging right away! The relaxed look of cotton Highlander Shirt makes it ideal for almost any occasion.The neckline is accented by a three-button closure. Made of 100% cotton, our Sailor's Pants have a drawstring waist band and discrete, deep front pockets. To finish the look, we add our Red Cotton Sash. Shown: Our Highlander Shirt in black, our Sailor's Pants in black, and our Red Cotton Sash.